Doctors and scientists are encouraging people to get out of their chairs and be more active during the day, even if they work in an office environment. That’s a great reason to look into using a stand-up computer desk. I’ve been using them at home and at work for four years, and love the flexibility they offer. I ordered the one for my home computer room for about $200 from Overstock.com (see photo and blog post about it here) and it works like a charm. Have been using it for more than four years. But it took some experimenting to find the perfect stand-up computer desk at the office. The first one I got was a metal device that you fastened the monitor to, and you pressed a lever to lift the monitor and keyboard up or down (depending on whether you wanted to stand or sit). Several things about it were awkward and inconvenient, though. The constant pressing of the lever to move it was annoying, and the apparatus was so large that the keyboard rack and keyboard jutted out and consumed all the personal space behind it. 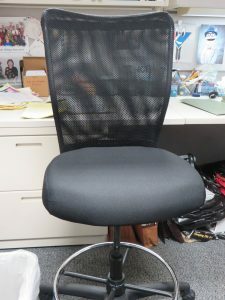 To stand behind it, I had to shove my desk chair over in the corner of the small cubicle. I asked the facilities people to take it away and give it to someone else, and my “pain in the neck” disappeared right afterwards. 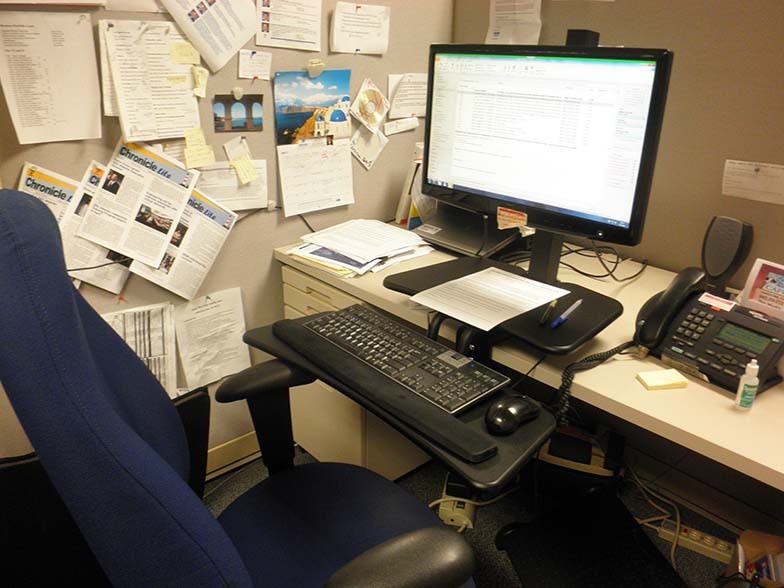 Went back to a regular desk for a while, and then I asked the facilities people to move the shelf (desktop) up to a comfortable standing position. Then I set my monitor on a stack of books so I was looking slightly down at it in an ergonomically correct position. 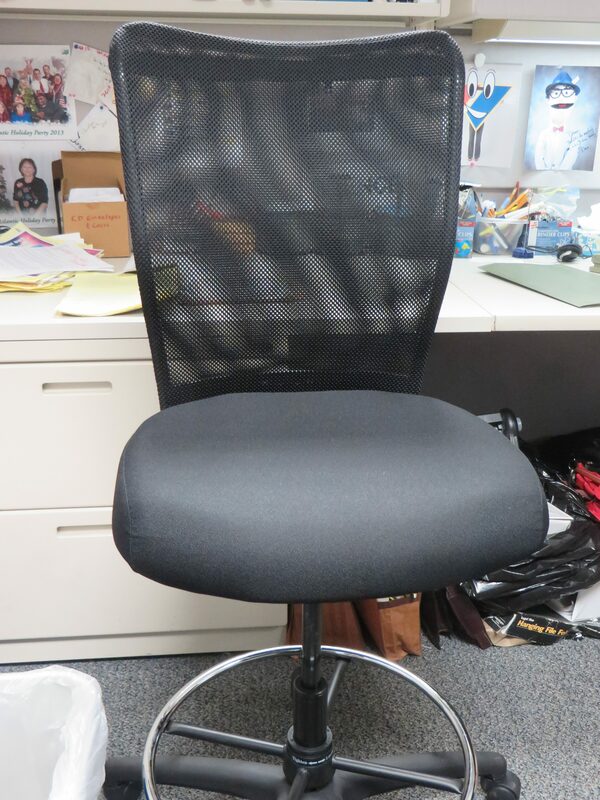 The facilities folks gave me a nice, tall stool with a mesh backrest and I bought a gel mat to stand on. The stool puts me at just the right height when I sit down, and the elevated shelf makes everything just the right height when I stand up. Have been using that set-up for more than two years — and it’s the perfect arrangement! Almost every day, I stand up and read email and type for the first hour or hour and a half, then sit until lunchtime. After lunch, I stand a while and then sit at the end of the day. It’s a good feeling to take positive action to do something to improve your health during the eight-hour workday with very little effort! 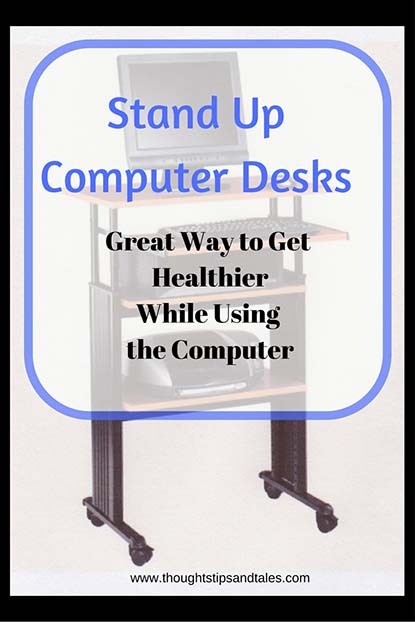 This entry was posted in fitness, health, stand-up computer desks and tagged fit at work, fitness, fitness in the workplace, health, improving health at work, stand up workstation, stand-up computer desks, stand-up desks. Bookmark the permalink. Thanks! Haven’t heard from you a while and thought you might be on vacation. I agree. That’s a healthier option. Sitting down for long hours in the day can’t be good for long-term health. 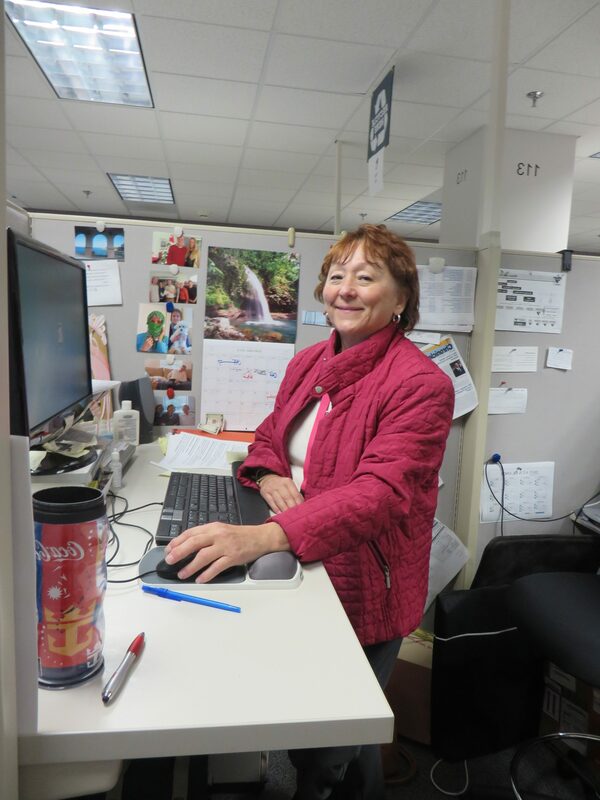 Nice setup Diane! My son uses one too for years and loves it. Thanks for sharing this! Hi Carolann — thanks for stopping by! Nice setup. Glad you experimented and found something you liked. This set up looks great!